Beta blockers are one of the most widely prescribed group of medicines. Beta blockers can be a challenge for the student. There are many beta blockers, each of which is used for their own set of indications. Some are used for hypertension but not heart failure, others for atrial fibrillation but not hypertension. The list goes on. That’s why we’ve put together some helpful beta blocker mnemonics to get you started. We’ve also added some great infographics that tabulate the information you need to know. 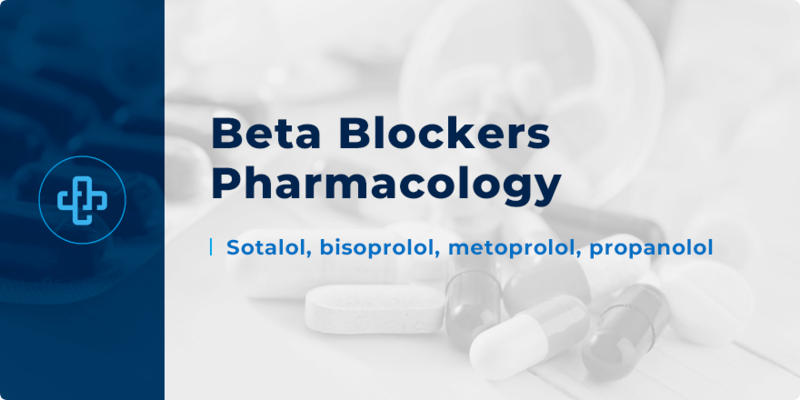 While this account of beta blocker pharmacology is not intended to be exhaustive, it does offer a convenient overview into what is an important clinical topic. Ischemic heart disease – first-line agents in the treatment of angina and acute coronary syndrome; improving both symptoms and overall prognosis. Chronic heart failure – again, beta blockers improve prognosis. Atrial fibrillation – beta blockers reduce ventricular rate. Supraventricular tachycardia – used to restore sinus rhythm. Hypertension – no longer first-line treatment, typically used with other medicines where appropriate. Ocular hypertension / glaucoma – drugs such as timolol and betaxolol are used for this purpose. Migraine – used for prophylaxis; timolol and propranolol most commonly used. Before we come to beta blockers and indications, let’s first review how we can identify beta blockers and how we can memorize their mechanism of action. If you’re just starting out with pharmacology, one suffix above all will soon sear its way into your memory. That suffix is -lol – the primary identifier of beta blockers. No matter what indication the drug happens to have, you can identify the presence of a beta-blocker through the presence of this simple, memorable suffix. Beta-1 adrenoceptors can be found in the heart. This contrasts with beta-2 adrenoceptors, which are found along the lining of the lungs. The mnemonic below illustrates a simple, popular and convenient way to recall this fact. We’ve already talked about the indications of beta blockers. Some are used to treat chronic heart failure and hypertension, others to treat glaucoma and hypertension. The infographic below illustrates these indications and what you need to know. Gastrointestinal effects – nausea etc. Beta blockers are also known to cause sleep disturbance and/or nightmares. Some men experience impotence. More lipophilic beta blockers – such as propranolol and metoprolol – are more likely to cause sleep disturbances due to their high penetration across the blood-brain barrier. Beta-2 receptors are linked to disruption in glucose and lipid profiles. Blockade of beta-2 receptors lowers plasma glucose levels. Many of these side effects are illustrated below. Due to the risk of bronchospasm, beta blockers should be used with caution in patients with asthma. Non-selective beta blockers are an absolute contraindication because they block beta-2 receptors – which are in the lung. Cardioselective beta-blockers pose a lesser risk but this risk is invariably dose-dependent. Preferably, beta blockers should still be avoided in these patients. Due to the risk of hypoglycaemia, beta-2 blockers may mask the symptoms of hypoglycaemia in diabetic patients. Enjoyed those beta blocker mnemonics? Register with PharmaFactz today to receive instant access to hundreds more! In the meantime, take a few moments to join our newsletter (above) to receive all the latest facts direct to your email!